Ever wonder about the origins of the historic building on the southwest corner of George Street and Third Avenue? Number 301 George Street (now occupied by EDI Environmental Dynamics Inc.) began its life as a butcher shop, the construction of which commenced almost 100 years ago this week. On February 20, 1915, contractors hired by P. Burns & Co., western Canada’s largest meat-packing company, were busy levelling ground at the site. Hammers began hitting nails shortly thereafter. Before the end of March 1915, the new building was complete: a large double-fronted corner unit with 60 feet of plate glass facing George Street and another 80 feet facing Third Avenue. 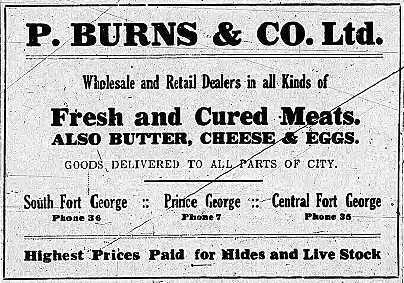 This advertisement for P. Burns & Co. ran in the May 28, 1915, edition of the Prince George Herald newspaper. The meat company had three retail outlets in the Fort George area; the newest “Prince George” location occupied the corner unit of the P. Burns building. The building became known as the P. Burns building — or the Burns block — and its flagship tenant was a P. Burns & Co. retail meat shop. The meat shop occupied the building’s corner unit and boasted “every possible convenience and invention known to the meat business,” including cold storage facilities.1 The Northern Lumber and Mercantile Company, which sold hardware and men’s clothing, occupied the section of the building behind the meat shop, facing George Street. The Burns block was part of a wave of rapid development that swept across Prince George in the years following incorporation. Most of the original buildings on the west side of George Street between Third and Fourth Avenues sprang up alongside the Burns block — including the two buildings immediately south. The first building, neighbour to Northern Lumber and Mercantile, was completed in March 1915; it housed real estate and insurance broker Norman H. Wesley and clothier H. G. Perry. The second building, a two-story structure located closer to Fourth Avenue, went up shortly thereafter and housed Baird’s Clothing & Shoes and G. A. James Drugs. The P. Burns & Co. meat shop operated from the corner of Third and George until January 1933, when it was purchased by Vancouver-based Sterling Food Markets Ltd. Sterling Foods continued to sell meats and other foodstuffs from the same location until February 1940. The Sterling Food Market occupied the Burns block’s corner unit from 1933 to 1940. Here, two butchers pose with fresh stock trucked in by a local supplier. Ben Baird’s commodious new clothing store opened at the corner of Third and George in October 1940. It replaced the original P. Burns building, built on the site in 1915. “P. Burns new market,” Fort George Herald, 20 February 1915, page 1; “P. Burns in new premises,” Prince George Post, 27 March 1915, page 1. “Ben Baird builds business block,” Prince George Citizen, 2 May 1940, page 1; “Local happenings,” Prince George Citizen, 24 October 1940, page 8. Fort George Herald: 4 October 1913; 20 February 1915. Patrick Burns (businessman), Wikipedia (accessed 20 February 2014). Prince George Citizen: 2 February 1933; 29 February 1940; 2 May 1940; 24 October 1940. Prince George Herald: 28 May 1915. Prince George Post: 16 January 1915; 20 February 1915; 27 February 1915; 6 March 1915; 27 March 1915; 3 April 1915.